On October 23, Charge d'Affaires a.i. 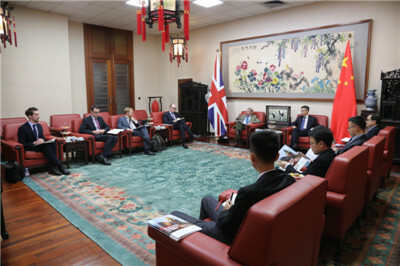 Zhu Qin held a talk at the Chinese Embassy with experts and scholars, including the Rt Hon. Lord Wood of Anfield, advisor to Former Prime Minister, Gordon Brown, Gerard Lyons, Chief Economic Advisor to the Former Mayor of London，and John Plender, Non-executive Director of OMFIF. Zhu noted that, for a period of time, the belief in unilateralism and protectionism has led the US to continuously adopt restrictive measures on trade with China. Being firmly committed to safeguarding the common interests of the two countries and the international trade order, China insists on resolving the disputes through dialogue and consultation. However, America’s failure to keep its words has led to escalations which not only severely affected the normal development of China-US economic and trade cooperation, but also seriously threatened the multilateral trading system and the principle of free trade. China is willing to work with all countries in the world, including Britain, to oppose protectionism, support free trade and maintain a rules-based international economic and trade order. Lord Wood said that the UK is the standard-bearer of multilateralism and free trade. 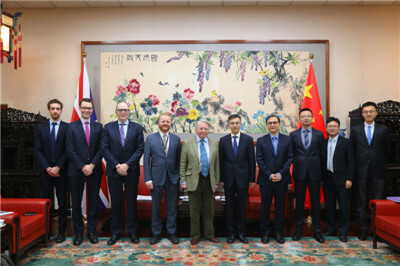 To further strengthen economic and trade relationship with China is an important part of the “global Britain” strategy and in the interests of the UK. He hoped that China and the US could settle the trading disputes properly through consultation, which would be beneficial to the development of the world economy and trade. 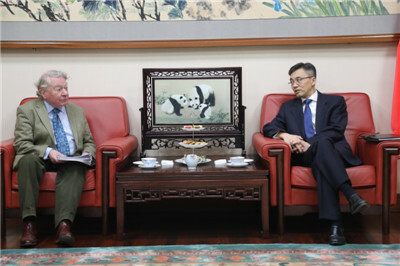 The two sides also exchanged views on the global economic situation, Brexit, China-UK relations, and China-US relations.